In the state of Alabama, apostilles are issued for both public and private documents by the Secretary of State in Montgomery. They must have the signature and embossed seal of the current Alabama State Registrar and director of Centre for Health Statistics, Catherine Molchan Donald, the signature of a Probate Judge, of a Circuit Clerk and the signature and seal of an Alabama public notary. Documents bearing the signature of Dorothy S. Harshbarger are not accepted for apostille. Notarized documents must have individual Notary County Certification issued by the County Clerk Recorder. 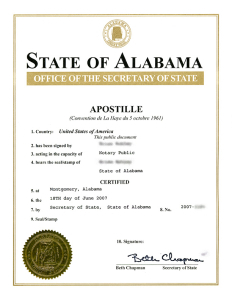 School transcripts and diplomas issued by universities of Alabama must have the signature of an Alabama Notary Public before requesting apostille. School seal and signature authority only are not suitable. If marriage and divorce documents are public and can be requested by anyone, duplicates of vital records have limited access and can be requested only by the person named in the document or a family member (mother, father, husband, wife, children, and siblings). Price is $5 per apostille with payment to the “Alabama Secretary of State”. For vital records you need to contact the Alabama Department of Public Health.